Above image: The great white shark is a lamniform shark, a group that dominated oceans in the Cretaceous Period. 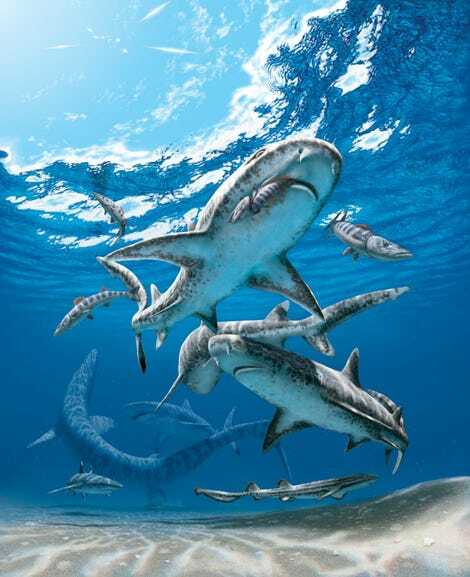 But by studying the varying shapes of hundreds of ancient, fossilised shark teeth, researchers found that Carcharhiniformes shark diversity—the biggest shark order today that includes hammerheads, tiger sharks, and more—exploded after the end-Cretaceous mass extinction, whereas many lamniform sharks went extinct. That disparity could be due to changing food sources after the extinction, Mohamed Bazzi, lead study author and palaeontologist at Uppsala University in Sweden, told Gizmodo. Lamniform sharks likely ate a lot of squid and marine reptiles, but many of those died out. Small bony fishes, on the other hand, started to swarm the seas, much to the delight of the carcharhiniform sharks that preyed upon them. Understanding that timeline could even be useful for keeping today’s sharks from going extinct. That extinction risk is serious, as we overfish oceans and contribute to global warming. Today, over 50 per cent of shark species are either endangered, threatened, or near-threatened, the researchers noted.